"So Caving is just grubbing about in tight muddy holes in the ground then." OK, so there is a bit of this, but there is so much more to caving. If it was just grubbing around through constricted muddy holes in the ground, then few of us would do it. 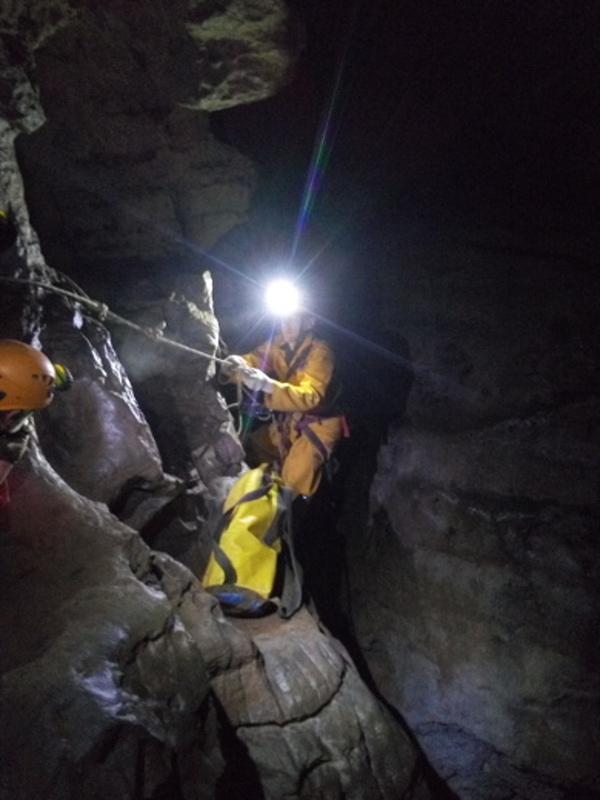 This short film by Andy and Antonia Freem of South Wales Caving Club gives you a taste of why we do it. This is very personal. If you asked any caver they would probably give you a different set of reasons. Here are just some. Caving is a low impact sport that gives a workout of pretty much every muscle in your body. You'll find muscles aching the next day you never knew you had! You may not be fit when you start, but after a few regular trips you will be increasingly so. You go caving with strangers, but come out with friends. Some of them lifelong friends. Caving is very much a team activity. Everyone is contributing to the success of the trip. Sometimes there is a leader, other times there is none. Some people are good at rigging, route finding, or climbing. Everyone has something to contribute, even if it is only a good joke told when stopped for a spot of lunch. You get to see sometimes amazing places that few others will get a chance to visit. Beautiful calcite formations that range in size from delicate hollow straw stalactites, only the width of the drops of water that formed them, to curtains and cascades of calcite taller than you are. Powerful underground streams and rivers, carving out deep, clean washed rock canyons underground and plunging over waterfalls, sometimes hundreds of feet deep. Chambers so big you cannot see the other side. Fallen blocks of rock the size of houses. Exploring an old lead mine. Seeing the props, stacked rocks and sometimes the clay tobacco pipes and broken tools and shoes, even footprints the miners left behind centuries ago. Realise that they worked here day in day out, lit only by tallow candles. Returning to the surface and smelling the greenery in summer, or snow in winter. Some days you'll see clear views over the hills. Others the mist and darkness will be down. The wind will be howling. Walking back with your friends. Maybe visiting a nearby pub after getting changed. Some caves are very difficult to get down and will tax you to the limits of your ability. When you get to the bottom you are not even half way there. To get out gravity is going to be against you all the way to the surface. Learning the skills to safely rig pitches for SRT. The challenge of physically moving through cave passage in a neat and efficient way. After much hard work digging out gravel and mud, or traveling to the far corners of the world on expedition, you can be the first person to ever see and walk through a new bit of cave. No other human eyes have ever seen this. Your footprints will be the only ones. You get to name your new discovery. Where else in the world can you still do this and be a real explorer? You can say "More people have been to the moon than some of the places I've gone". Other people will have different reasons. Some will be interested in the geology that lead to the cave forming where and how it did. Others in the mining history and the methods the miners used. There is life underground, some species living their entire lives in darkness. Photography can provide a way to bring some of your experience of the underworld to others. Sounds Good. I Want Some Of That. If this sounds like something you want to be involved with, then get in touch! Er Wang Dong cave in China. Photo © Grace Chu.